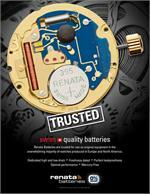 Full line of Renata Watch Batteries, Hearing Aid Batteries and Lithium Batteries. Born from the Swiss watch industry, RENATA batteries are trusted for use as original equipment by the world’s most respected brands - several hundred million times a year. 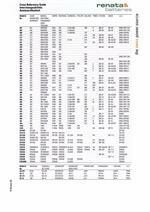 Ask about Renata 0%Hg (Mercury Free) silver oxide batteries with easy to read date code markings. We stock: Silver oxide, Lithium 3V, Zinc-air and Alkaline batteries. Sold to watchmakers and stores only. Please Call for Pricing. Renata, uncompromising, dedicated high drain and low drain silver oxide batteries are available for optimal performance in all your watches.